Can any festive season be complete without a lot of good food .....read that as rich and fattening type foods. That seems to be the common factor in every festive season. And of course since it is the festive season we end up indulging a little .......err maybe I should say ......a lot :-) Anyway after indulging in this type of rich food, snacks and sweets, I start to crave something very simple and nutritious. Soak chana dhal in sufficient water for at least 30 mins. Drain water, fill with fresh water and cook in the microwave or the stove top until the chana dhal is cooked yet firm and not mushy. Heat coconut oil in a large heavy bottomed pan, add mustard seeds to it. When the seeds begin to splutter, add green chilies, asafoetida powder and stir a couple of seconds or until the green chilies acquire whitish spots. Add turmeric powder, stir once or twice, then add cabbage, salt, sugar and mix well. Cover the pan with a lid and allow the cabbage to cook on low to medium low heat. 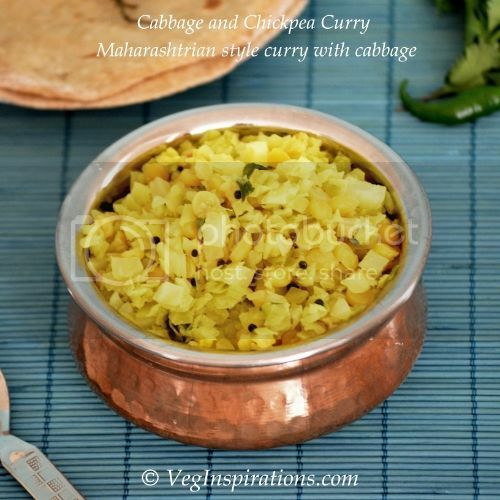 When the cabbage is soft, add the cooked chana dhal and mix well. Allow this to remain on low to medium low heat for a few more minutes for the flavors to mingle. Garnish with finely cut cilantro leaves. Remove from heat and serve hot with phulkas or plain steamed rice and dhal. I served this with plain phulkas and loved the combination a great deal.